A creative, innovative and professional music school specialising in the tuition of a variety of musical instruments. Open to both children and adults of all ages whether to work towards grades or just for fun! The academy launched in September 2015. Watch this space for lots more exciting information. We can offer blocks of lessons in all of the instruments we tutor! 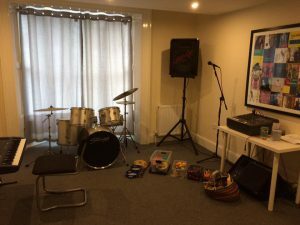 Check out our ‘Music Tuition‘ page for more info! The academy is situated within a 2 minute walk from Thame Town Centre. We have 3 large professional teaching rooms, a waiting area and the usual amenities. Parking can be found free of charge in the car park directly opposite. Do you love live music? TMA hosts a variety of monthly events in the Thame area! TMA is involved in a huge variety of events in the local area. Our monthly ‘Friday At The Fish’ open mic takes place at The Old Fisherman, Shabbington every 2nd Friday of the month. The event is always busy with a fantastic atmosphere and brilliant live performances from local artists. If you are interested in coming along to play please ‘Contact Us‘ or search ‘Friday At The Fish’ via Facebook. TMA also provides live music at The Birdcage, Thame (Every 2nd Saturday of the month) and The James Figg, Thame (Every 3rd Saturday of the month) – These events showcase a variety of local bands, duos and singer/songwriters and is proud to be in association with Black Frog Studios Record Label, based in Thame. TMA can provide gift vouchers for lessons in any of our instruments and with any of our fantastic tutors! Vouchers can be for any amount of lessons and are valid for up to a year from purchase. Please ‘Contact Us‘ for more information and to purchase a voucher.